Jeremie Francone and Laurence Nigay from the Laboratory of Informatics of Grenoble at the EHCI Research Group have created one of the most impressive and, overall, amazing tech demoes for the iPad we've seen recently. 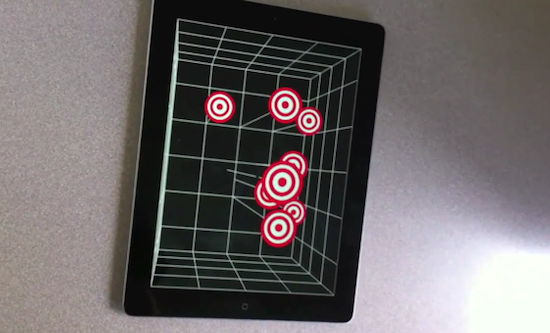 By combining head-tracking technology that uses the iPad's front facing camera with basic 3D graphics, they have developed a glasses-free 3D experience that doesn't require the accelerometer, but it's entirely based on the camera and the movements of a user's head in front of the screen. As you can see in the video after the break, graphics on screen change accordingly to the position of the user to give the illusion of tridimensional objects moving on the display. It is pretty amazing that this system only uses the camera and the effect is so well conveyed in a video. We track the head of the user with the front facing camera in order to create a glasses-free monocular 3D display. Such spatially-aware mobile display enables to improve the possibilities of interaction. It does not use the accelerometers and relies only on the front camera. Glasses-free 3D has been deployed by Nintendo in its latest 3DS portable gaming console, and a series of reports in the past suggested Apple could implement glasses-free 3D gaming for the next-generation iPod touch. The demo we have here today is truly impressive, so make sure to check it out below.